A recent discussion on the Sacramental Nazarenes Facebook page forced me to ask and answer a question: What specifically is the pastor’s role in worship? There are no doubt a number of answers to this important inquiry. Some answers are better or worse than other answers, and the “better or worse” is largely related to biblical fidelity, theological integrity and liturgical propriety. That is, our answer will be far more adequate when biblically sanctioned (the Regulative Principle) and biblically informed (the Normative Principle) priorities and practices of worship are understood, accepted, and followed. One priority of worship concerns itself with the role of the pastor. The pastor must lead in worship, and not cede h/er authority to others. If pastors are commissioned and committed to the dual ministry of “Word and Sacrament,” we cannot and we must not deny or delegate these responsivities to others. We must either, quite frankly, step up or step out. When we examine the established role of the twelve Apostles (Luke 24:13-35; Acts 2:42; 6:1-7) or Paul’s clear emphasis (1 Corinthians 11:17-34) there is no other option. While the “priesthood of all believers” does confer upon all Christians certain inalienable rights, pastors have these “rights” as “roles” and “responsibilities” uniquely. This does not mean that the pastor must actually be the “Worship Leader.” Some people are particularly gifted and graced for this ministry. What it does mean is that every word and action in worship falls under the role and responsibilities of the pastor. As such, from beginning to end, the pastor must oversee and approve how worship occurs. While the Elders, Worship Committee and Worship Leader may contribute, and in may fact provide important insight, it is the pastor who must ultimately decide. To supplant this is to subvert pastoral authority– and this in h/er most important ministry. The demands that this places upon pastors are manifold and manifest. As such, the pastor must be liturgically informed, liturgically transformed, liturgically articulate and liturgically expectant. I recently had a conversation with a pastor whose “Worship Leader” had absolutely no formal training in Worship Studies. Apparently, at least in this large church, the only qualification for leading worship was being able to play a guitar and sing. Many churches are not much different. If you were to ask many leaders of worship about the biblical theology of worship– its priorities, principles and practices– very few would be able to provide a comprehensive and coherent answer. And, sadly, the same assertion applies to pastors. The pastor as worship leader, as the pastor who provides the biblical and theological framework for true and laudable worship, must be liturgically informed. S/he must be educated and catechized in the cause and craft of worship. This pastor must know the history of worship within the Bible, its theological frameworks within the church, and how Bible and theology applies to belief and behavior. If the pastor cannot provide anything beyond the basest and broadest biblical and theological apologetic for worship, and this containing a framework for both the substance and structure of worship, s/he will compromise both “Word and Sacrament.” As such, and not to be overlooked, s/he will also compromise the health and welfare of the entire congregation. If the congregation is not informed and transformed through well-ordered worship, it will be deformed. This requires that the pastor experience worship as it is intended to be experienced. S/he, by an experience of worship and encounter with God, will be able to testify to the impact of liturgy upon life. That is, in other words and contrasted with my point above, education is not enough. Worship education, while important, can only inform. What is required is not just academic information (although it is needed), but socio-psycho-pneumatic transformation. Catharsis is required– the true catechesis of the heart. Liturgy must change the life of the pastor. Let me provide an example. One of the 16th century’s unsung heroes is martyred Archbishop of Canterbury, Thomas Cranmer. Almost everyone knows Luther and Calvin. Some are familiar with Knox and Zwingli. A few might know of Bucer and Peter Martyr. 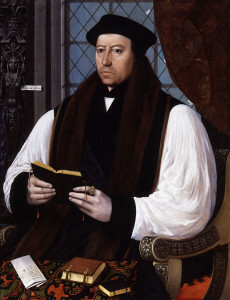 Rarely does anyone hear about Thomas Cranmer, however, besides those who belong to the Anglo-Episcopal family. In spite of this, and although Luther and Calvin have huge literary legacies, Cranmer may have had the longest and strongest impact. What did Cranmer do? Thomas Cranmer embraced a very basic idea: The family that prays together will stay together. Consequently Cranmer’s reforms largely revolved around worship. Taking the complicated process of public worship as found in the Roman Catholic Church, and reshaping it around Protestant biblical priorities for the “common” man, Cranmer consistently, concisely, and beautifully distilled and detailed what worship should look and sound like. By providing his nation with the Book of Common Prayer, centered as it was upon reformed theological principles, Cramer reformed individuals, homes, families, congregations, and an entire nation. Common prayer in the common tongue was for common men in their common lives that were commonly shared when they commonly worshiped publically and privately. Because everyone was (quite literally) “on the same page,” reciting the same words, reading the same Readings, saying the same prayers and hearing wholesome doctrine, Cranmer’s liturgy became life for countless millions. And this is exactly the point: Cranmer knew liturgy, language, and life. Experiencing it personally, and encountering God in an entirely reformed yet reforming manner, he was able to communicate it to others. (It must be noted, as well, that divisions in the Anglo-Episcopal family has had everything to do with proper worship as rooted in God’s written revelation). The pastor, as well, must be informed and transformed. As noted above, Cranmer was liturgically literate. He knew the “who,” “what,” “where,” “when” and “why” of worship. Cranmer’s entire liturgical enterprise was precise. The structure and the substance of worship were part of his purview. He could provide an answer– and a very well-rounded answer– to anyone who made inquiries. He knew his topic. He could communicate his topic. He knew why he did what he did. Worship was not just an interest, it was a vocation. Although Cranmer had a unique gift and vocation, pastors are also called to liturgical articulation. As pastors we must also be able to provide sound biblical and theological answers for every word and action in the Service of Worship. There must be something beyond the misguided and misinformed “missional” orientation and motivation that drives so many churches today. We must move beyond our tired methodologies of attraction that provide little more than a weekly “shot in the arm.” The entire “traditional” or “contemporary” set of discussions and disagreements are predicated upon pronounced biblical, theological, and liturgical ignorance. Pastors must be able to provide answers about the “who” through the “why” of worship. From entrance into the church, and throughout the entire process of Word and Sacrament, to the Benediction and beyond, the pastor must be able to clearly articulate a theology of worship. If s/he cannot do so, s/he has failed in one of h/er chief callings. Do we know exactly why ANNOUNCEMENTS should be at point “A,” “B,” or “C” of the Worship Service? Can we precisely discuss and defend our position? Can we provide a well-rounded biblical and theological apologetic for our thinking? The same exactitude is required for every part of worship– specifically public worship. Worship changes us, or has the God-ordained ability to do so. The current condition of the Church, our repulsively shallow and hollow expressions of American Christianity, can be traced to biblical, theological and liturgical illiteracy. We do not know our Bibles and, as such and according to St. Jerome, we do not really know Christ. As he so forcefully said, “Ignorance of Scripture is ignorance of Christ.” We do not know what we believe, why we believe, and why it matters. Can most Christians we know offer a comprehensive yet concise overview of the Bible and its major themes? Can we articulate the beginning and the end of our Christocentric emphasis and how covenant and creeds are central to this? Can most Christians speak anything beyond ill-informed Theo-speak? By-and-large we do not know how to worship, either. If we do not know the former, we do not know the latter. Rarely can anyone, including pastors, discern, declare and defend a theology of worship that includes references to Old Testament, New Testament, and the broad history of the Church. We are deaf and dumb, and we declare it weekly in worship. (I can also listen to a radio broadcast for less than five seconds and be able to identify a “Christian” broadcast by its insufferably saccharine sounds and songs). Worship changes us, and has the God-ordained ability to do so. This must be our expectation. When we worship as God calls us to worship we will be changed– and it won’t just be a feeling. When we worship as God calls us to worship, liturgy will become life. When we worship as God calls us to worship, and even without the “bells and whistles” of the contemporary cacophonous claptrap, the world will begin to wake up and listen. When we worship as God calls us to worship, which translates into living as God calls us to live, the world will supernaturally (NOT naturally, as so-often happens today) begin to ask us about the hope that lives and is expressed within and among us. As in the early Church, and as expressed in the Bible itself, the truest catechesis is of the heart– and catechesis begins with worship. Pastors will either lead or cede in this matter.